Mexico’s Grupo Modelo brewery on Monday May 8 inaugurated a $443.7 million plant in Yucatan, a move that Mexican President Enrique Peña Nieto called a “turning point” in transforming the country into a “trustworthy destination” for investment, EFE news agency reported. 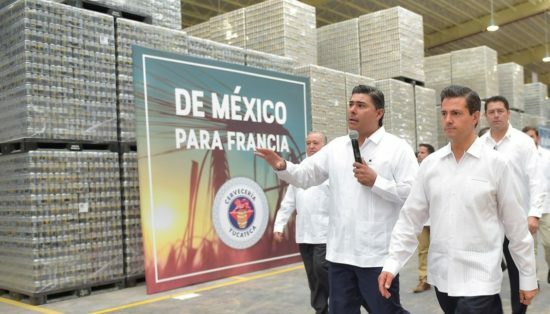 At the inaugural event, held in the town of Hunucma, the president noted that Grupo Modelo, which is owned by Belgian multinational Anheuser-Busch InBev, allocated 8.5 billion pesos ($443.7 million USD) to establish the plant. Peña Nieto said that Mexico has become a “more attractive country” and is ready to attract investments thanks to the structural reforms pushed through during his administration. For Yucatan, the plant is a “turning point and of great relevance for the industrial sector,” the president said. Companies, Peña Nieto went on to say, are seeing the Hunucma industrial park as “a great place to invest” thanks to its strategic geographic location, which facilitates connections with Mexico’s southeast and with other parts of Latin America and the world. All that constitutes a “new push that will explode in the coming years,” the president said. Currently, Mexico is the world’s fourth-largest beer producer and the No. 1 exporter of the product.